Olivier Bétoin was once asked who his heroes were. 'I don't have heroes,' he replied. 'I respect those who do good without any recognition'. My header photo is from the early 1930s and shows the isolated farm of La Coûme in French Catalonia. Opened in 1933 as a vacation centre for young people, La Coûme went on under Quaker stewardship to become an important shelter for refugees from the Nazi regime. La Coûme continues today as a youth activity centre with a strong musical component and is managed by Olivier Bétoin, who is the son of one of the founders. There are many paths leading from this quintessentially thin place. 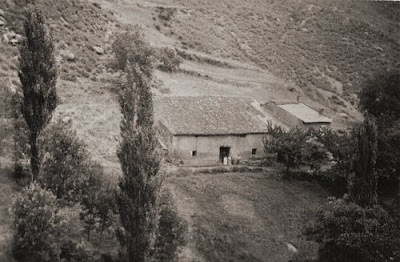 One goes to the nearby holy mountain of the Catalans, Mount Canigou and on to the Cathar castle of Quéribus with its Gnostic connections, while another leads to Prades where Pablo Casals lived in exile. And talking of the balance between doing good and recognition, 86% of readers who voted in my recent poll said that $1 million dollar music prizes are not a good idea. So, forget about heroes. Header quote is from Love and War in the Pyrenees by Rosemary Bailey. Photo credit Olivier Betoin/La Coume. Any copyrighted material on these pages is included as "fair use", for the purpose of study, review or critical analysis only, and will be removed at the request of copyright owner(s). Report broken links, missing images and errors to - overgrownpath at hotmail dot co dot uk Also on Facebook and Twitter. So...how much is needed to be considered a good idea? Or are cash prizes not needed at all? So it's not actually the cash prize that's the issue, it's the choice of recipient! Jay, my view is that huge cash prizes turn classical music into an X-Factor style freak show and are therefore undesirable. But if we have to have them, it would be better to award the money to the musicians who need it, and that is not Placido Domingo and Riccardo Muti. However, that is my view and I am sure others will have different opinions.